Carlo Colombo, a leading figure in the new generation of italian architects, brings a clear-cut and glamorous touch to the driade home. Garçonne, whose structure is fully covered with precious leather, is a sofa boasts wide and generous shapes; its soft and large cushions in leather or fabric are bounded by slim, gently curved armrests. Completed by the armchair, Garçonne is a luxury item, a fully-fledged protagonist, designed for people who love meeting friends and relaxing with their family. 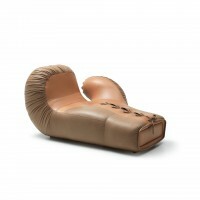 metal structure, goose feather and different densities polyurethane foams padding and seat with elastic straps. 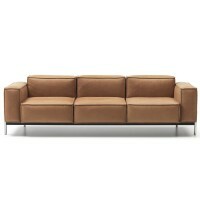 fixed structure leather cover and removable cushions fabric or leather. w. 35 d. 31.5" h. 30"; seat h. 16"
w. 87" d. 39" h. 30"; seat h. 16"